A fantastic new colour school thesaurus for ages 10+ in the best-selling Gem format. Written specially to help with school work and homework, this new edition of the Gem School Thesaurus provides thousands of synonyms to increase vocabulary, with examples to show context for ever... read full description below. 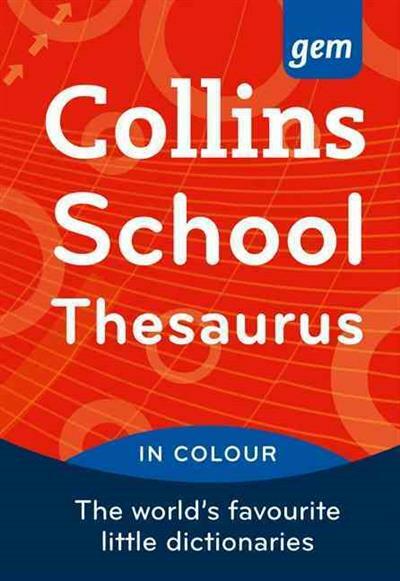 A fantastic new colour school thesaurus for ages 10+ in the best-selling Gem format. Written specially to help with school work and homework, this new edition of the Gem School Thesaurus provides thousands of synonyms to increase vocabulary, with examples to show context for every synonym listed. This handy thesaurus includes all the newest words in the English language, plus an updated supplement to provide help with finding the right word. Unlike any other school thesaurus, with the Collins Gem School Thesaurus you can be sure you're using the right word every time. Every entry has a definition, and each alternative word is followed by its own example, helping you decide which word is the most appropriate to use. The perfect companion to the new Collins Gem School Dictionary, and an indispensable tool for any school student aged 10+. Using a thesaurus has never been easier!